Erkin Koray and Sublime Frequencies are pleased to present this collection of rare tracks and lesser-heard singles. 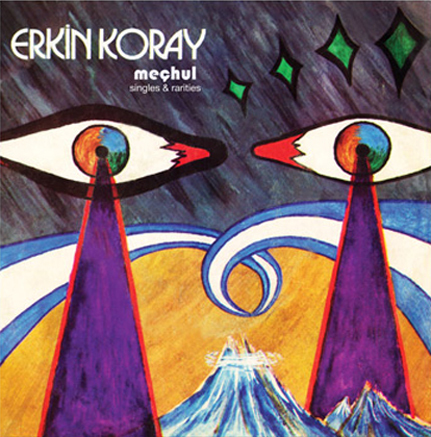 All tracks were recorded and released in Turkey between 1970 – 1977 and culled from Koray's personal vinyl collection. Includes exclusive photos and remastered audio. What more is there to say about Erkin Koray? An iconic guitar and songwriting genius. A voice of gold – Having founded the country’s first ever rock and roll group in 1957, he is regarded worldwide as the father of Turkish rock. Forging western sounds with his own inimitable musical mastery, he self-produced singles and LPs throughout the 1960s and 1970s that shook and altered Turkish society. Erkin didn't stop at rock and roll. Over time, he began to find inspiration in folk sounds from Turkey's Anatolian interior, and radio broadcasts received from Egypt and Lebanon. He looked to the east from his west-leaning Istanbul perch, and began incorporating these sounds into his own work. This amalgamation was as unprecedented and unorthodox in Istanbul at the time as rock and roll itself had been in the 1950s. The resulting hybrid sound ignited what became known as the Arabesque music movement in Turkey – which continues to this day. While Erkin has recorded and performed tirelessly throughout the years, [both as a solo artist, and with the powerful groups he formed,] his extensive back catalogue only began to be explored by the international community in the 1990s. and influences have managed to, and his prolific work ethic has not ceased. He continues to live and breathe music, performing epic concerts, and continuously plotting new recordings and strategies. His vision and integrity, coupled with his pronounced world views and inherent musical greatness, have made him the unique and magnificent living legend he is today. This collection features tracks not found on the many unauthorized Erkin compilations and LP reissues that have emerged in the west over the years. Ranging from the sublime to the surreal, these tracks offer an essential glimpse into the extensive repertoire of the great Erkin Koray.